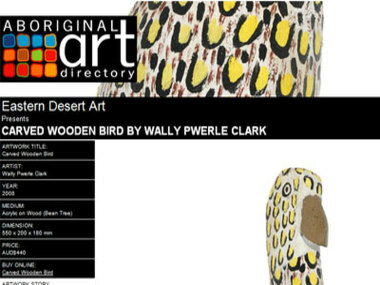 A eBlast sent to the Aboriginal Art Directory. This beautifully detailed work has been hand carved from the wood of the local native Bean Tree. The artist, Wally Pwerle Clark, works from a large piece of the trunk and chisels out the desired shape and finally adorns it in various ochre colours. This beautiful bird stands on a pedestal that stands at a hight of 55 cm. Wally is an exceptional sculptor and spends much of his time working on his pieces.